Antiepiletic drugs is an important topic for the preparation of GPAT. In this article complete pharmacology of these drugs is discussed. If you have any doubt regarding the topic you are free to ask by making a comment below. Here at GPATcrackers we will be happy to sort out all your queries. Epilepsy is characterized by group of neurological disorders in which patient suffers from series of seizures. Each single episode of the epilepsy is termed as seizure. c) Atonic seizure (Akinetic seizure)- Unconsciousness with relaxation of muscles (Patient may fall). d) Myoclonic seizure- Shock like contraction of muscles. 2. Partial Seizures: They are focused only to a specific portion of the body. Further they are classified into following. c) Partial Secondarily generalised. Initial Partial then go for tonic clonic. 1. Phenobarbitone: Its main mechanism of action is that it act as GABAa agonist. Major side effect is sedation. 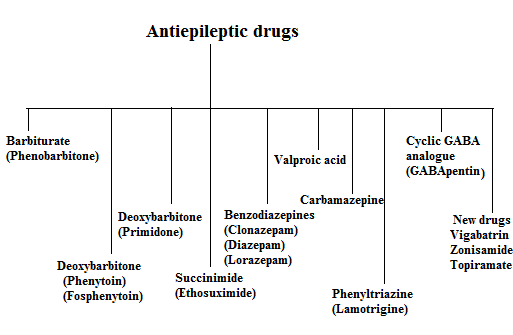 First line drug for the status epilepticus. 2. Primidone: Metabolized to phenobarbitone & Phenyl ethyl malonamide (PEMA). 3. Phenytoin: It is not a CNS depressant. It mainly acts by prolongation the inactivation of Na+ channels. Safe drug in cardiac arrhythmia. First line drug for Generalised tonic clonic and partial seizure. Drug of choice for status epilepticus after phenobarbitone. 4. Ethosuximide: It acts by inhibiting Ca2+ channels. Used in the absence seizures. 5. Carbazepine: Mechaism of action is similar to ethosuximide. First choice for complex partial seizures & neuroglias. Alternate to Li in bipolar & mood disorders. 6. Valproic acid: Drug of choice for absence seizures, myoclonic seizures. Mechanism is very complex. It acts through all the mechanism of barbiturates, phenytoin & Ethosuximide. Alternate to Li in bipolar and mood disorder. Also used for the prophylaxis of migraine. 7. Benzodiazepines: They are GABA agonists and used as adjuvants with the first line of drugs. 8. Lamotrigine: Similar to carbamazepine. 9. Gabapentin: Increase GABA release.